The Rugby World Cup is the premier international rugby union competition. The event is organised by the International Rugby Board (IRB) and is contested by national teams. The winners are awarded the William Webb Ellis Cup. William Webb Ellis was the Rugby School pupil who - according to popular myth - invented the game after picking up the ball during a game of football. The inaugural tournament was held in 1987, hosted by both Australia and New Zealand and was contested between sixteen nations. The All Blacks (New Zealand) became the first ever champions, defeating France twenty-nine points to nine. The subsequent 1991 tournament, which this issue commemorates, was hosted by England, with matches also being played throughout the rest of Britain, Ireland and France. Australia won the second tournament, defeating England, twelve points to six. The tournament is contested every four years and is one of the largest international sporting competitions in the world. 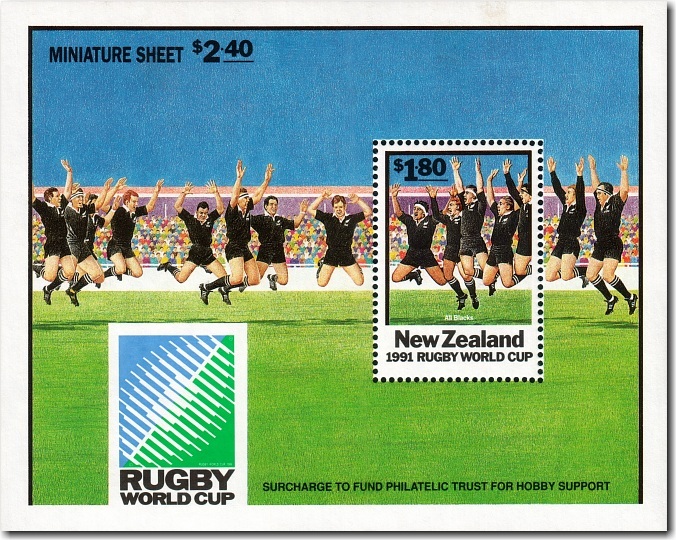 A miniature sheet containing the $1.80 stamp was issued with a 60 cent surcharge over face value donated to raise funds to help support hobby sport in New Zealand. The miniature sheet was also issued for the Philanippon '91 exhibition with the exhibition logo in the top right hand corner. This miniature sheet is listed under 1991 Philanippon in this catalogue.